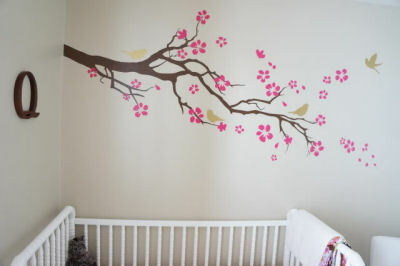 This baby girl's raspberry pink and gray nursery has an elegant and airy atmosphere including golden birds perched on branches and elements that make the room comfortable and cozy. The plan for this baby girl's raspberry pink and gray nursery was for the room to be one that she could grow with. Mom also wanted the space to be pretty as a picture as well as chemical free. As you will see, with careful planning, she was very successful on all levels. The nursery furniture, the most expensive part of decorating most nurseries, was chosen and purchased with that goal in mind. Everything included, minus a few baby-oriented decorations placed here and there can be used for a lifetime. 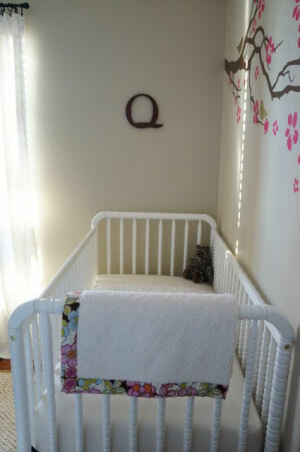 The crib also has a non-toxic, lead and phthalate free finish. Note to expectant mothers: Pretty does not necessarily mean safe. Check to be sure that you aren't buying stuff that brings baby in close contact with nasty chemicals. Freckles Chick hit a huge home run in this department. Not only did she take care that the environment in her baby girl's nursery was nice; she repurposed items which is good for the planet as a whole..this means me and you, kids. This ceramic garden stool bought for $20 (that's right twenty bucks!) at Big Lots about a year ago really puts the "razz ah ma tazz" in her baby girl's nursery theme and nursery color scheme. A few layers of (no VOC) spray paint gave it a whole new look and purpose as an occasional table. Seeing cool stuff like this is what makes writing feature stories fun for me. I wish I had great ideas like this all on my own. I'm hoping Freckles Chick won't fuss if I "borrow" her idea should I be lucky enough to find one of these pieces on sale. Where the recycled stool provides the big splash in the pink nursery decorations department; the flowers in the nursery wall decals are more subtle and refined. 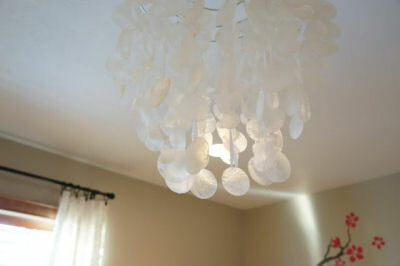 The capiz shell nursery chandelier was another item already on hand that fit perfectly into the design of the room. Now we get to the nursery pictures that every mom needs to see. 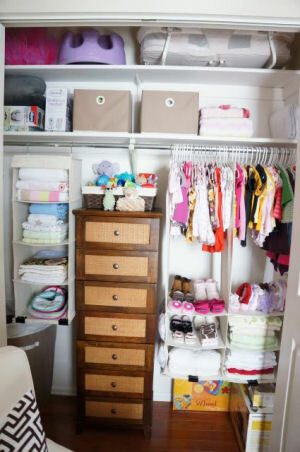 The nursery closet is as important to the nursery's decor as baby bedding and curtains; it keeps the day to day necessities needed to dress and care for a newborn organized. Speaking of organization and storage; what wouldn't I give for my dresser drawers to look like this? 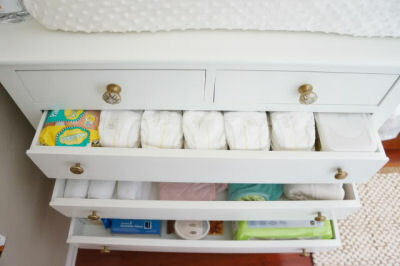 The baby's combination diaper changing table/nursery dresser was a Craigslist find that mom and dad refinished and updated with Anthropologie Art Deco style drawer pulls. The knobs they used have been discontinued but something similar can be found at Home Depot. Please visit Unique Baby Gear Ideas to see many more baby nursery pictures and please visit the Freckles Chick Blog to find a nicely detailed shopping resources list. I love your pink and grey nursery ideas and appreciate the recommendations for chemical free spray paint that you used to add lots of color to your daughter's room. I love spray painting items that are just lying around the house to make them look brand new again but had been holding back due to fear of exposing my infant to unnecessary toxins. You have set me free now I'm about to go to the store and buy cans and cans of paint and go wild! The stool was bought at Big Lots about a year ago and cost just $20! 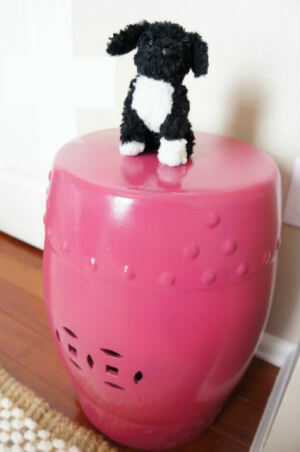 Can you please tell me where you got that pink ceramic stool?